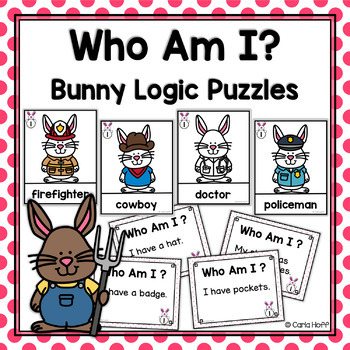 Bunny Logic Puzzles | Who Am I? Are you looking for a new idea for a spring or Easter center? 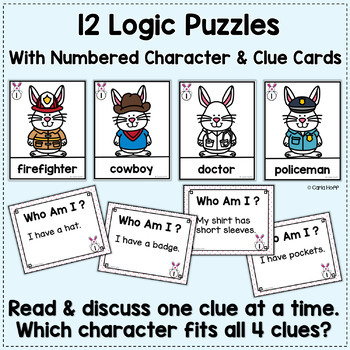 Your students will love these fun and engaging logic puzzles! 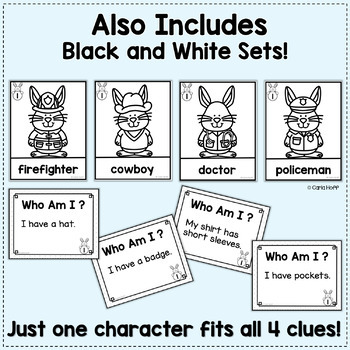 Each puzzle includes four clue cards and four bunny character cards, dressed for work --everything from doctors to detectives, pirates to painters and more! Partners take turns reading the clues to determine the one character being described by all the clues! 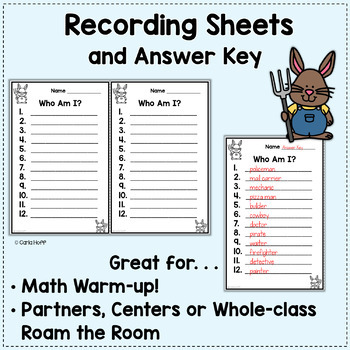 Perfect for partners to play in a center, or for a whole class activity. Either way, it’s easy prep for you, maximum engagement for your students! Please see the PREVIEW above for more information and a closer look at this resource! • Gingerbread Man Logic Puzzles - Who Am I? • Snowman Logic Puzzles - Who Am I? Don’t forget to leave feedback for your TpT purchases! You earn credits to use for any future TpT purchases, and your feedback is very helpful to me as well. I love reading it! If you like my work, follow my store to be notified when new resources are listed in my store. It pays to be a follower--new resources are 50% off for the first 24 hours! Thank you for looking! Please contact me if you have any questions.